After finishing the utterly fantastic The Lesser Dead by Christopher Buehlman last night, I tried to get into another book right away to try to stave of a severe book hangover. These are the two beauties I’m hoping to read this weekend. I figured I should probably read paper towns before seeing the movie. I picked it up last night and was very reluctant to put it down at about 1 am. This doesn’t seem to be anyone’s favourite John Green book though, so I don’t really know what to expect. I’ve heard so many amazing things about The Darkest Part of the Forest by Holly Black. People have been absolutely raving about it. So I’m really expecting big things from this one. Have you guys read these? Should I be excited about either of them? Yes? I’ve heard The Darkest Part of the Forest is good, but sadly I have not read either of them. I hope you can beat that looming book hangover! Those are the worst. 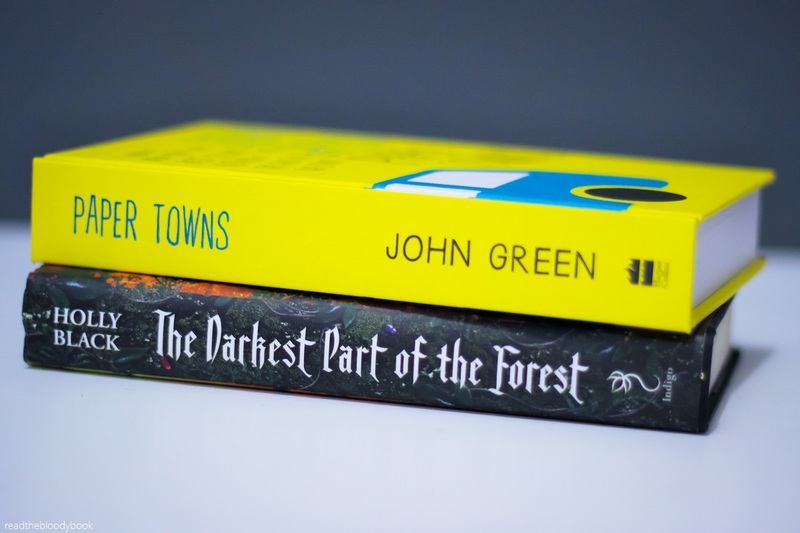 I read Paper Towns a while ago – it’s quite a unique story and the ending was definitely a surprise! – and The Darkest Part of the Forest is on my TBR list, because it just looks absolutely amazing. Also, just wanted to say how amazing your book photography is. It’s really inspired me to try and take some photos of my own now I’ve got my own blog! I will have to check your blog out then. Is it photography or specifically book photography? It’s mainly a book and writing blog, so when I do a review or talk about what I’ve been reading I try and take a few good photos to go with it! I don’t think I’m quite up to photographer status yet (I’ve only been blogging for about a week) but I’m learning 👍🏻 If you don’t mind me asking, do you have any tips on how to take the perfect book photo? my only real tip is that you need a proper camera. I know this isn’t always possible for everyone. But you couldn’t get photos like mine using a camera phone. But other than that I’d say to just experiment with different things and styles. Thanks! I actually inherited one of my Dad’s camera not that long ago when he got a newer version. He’s been trying to teach me how to use it and work through the software on his computer etc. – I’ll practice using it to post pictures on my blog! Thanks again for the useful advice and for following my blog, it’s really kind of you to take the time to answer my questions and have a look at my blog. And congratulations on writing such a brilliant blog yourself, it’s one of the most inspiring websites I’ve seen!